The world of high-end home audio is endlessly confusing. Buying and setting up speakers correctly is never straightforward, and more often than not results in money wasted and things sounding worse than they need to. My flat is a nightmare for audiophiles. It has wooden floors, obtuse angles where walls meet and a large set of windows that run the entire length of one side of the building. The result is, no matter how hard I try, I can never get speakers to sound as good as they should. Bowers & Wilkins were desperate for us to test out a set of its new 684 floorstanding speakers, but wouldn’t believe me when I said they would sound awful in the flat. Sensing a challenge, Bowers & Wilkins headed over to set the sound system up themselves, imparting some extremely useful home audio advice along the way. It’s important to note that firstly, Bowers & Wilkins didn’t let us keep the speakers and secondly, you can replicate this with any speaker brand out there. All you need to do is follow these tips and you should be able to get the most out of whatever audio system you purchase – or even have at home already. First things first, before you even set out to buy a set of speakers, you need to think about what you listen to. Try and class your listening habits into a set of genres so that when you head to a shop to pick up a new sound system, you can tell them what music will be played on it. This is because not every speaker is suited to every type of sound. Dance music fans will want something with plenty of bass, while classical listeners want a lighter, more detailed sound. Indie music is my thing, so Bowers & Wilkins suggested the 684s simply because of their more balanced mid-range and sound. Next up, you need to think about the space the speakers are going to sit in. Have a look around the room and consider any obstructions, seeing what could cause sound to bounce around unpredictably. For example, having speakers set facing a window is a bad idea, while tables and chairs will all obstruct the path of the sound travelling from speaker to your ear. 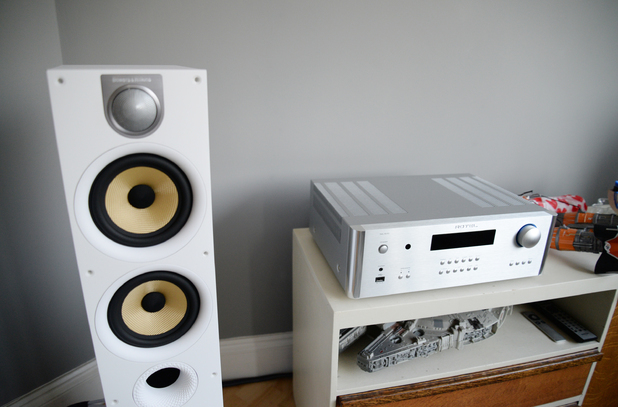 It’s a good idea to photograph the room itself and show pictures to the Hi-Fi shop staff – any decent retailer should be able to advise on speaker purchases using visual references.